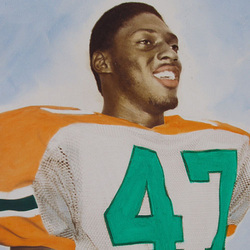 In the four years that Ottis Anderson spent at the University of Miami he not only broke eight long standing rushing records, he also established himself as the best runner in the history of the school. Anderson, a West Palm Beach native, became the first player in the school's history to rush for over 1000 yards in a single season, with 1266 in 1978, still the 3rd highest total in school history. His career achievements include breaking records in the following categories: career rushing yards with 3331; all-purpose yards with 4265; most 100 yard games with 13; and for longest kickoff return with two 100 yard returns. Anderson's single season records are equally impressive. In 1978 he set university records for 100 yard rushing games with 8 in 11 games, consecutive 100 yard games with four, and carries in a single game with 39. That season he earned acclaim by being named first team All-American by both The Sporting News and the Football Coaches Association. Anderson was a first round pick in the 1979 NFL draft by the St. Louis Cardinals, and was named NFL Rookie of the Year in 1979. In 1986, Anderson was traded to the New York Giants. He spent 14 years in the NFL, recording 10,273 career rushing yards and 86 touchdowns. He was a Pro Bowl selection in 1979 and 1980.